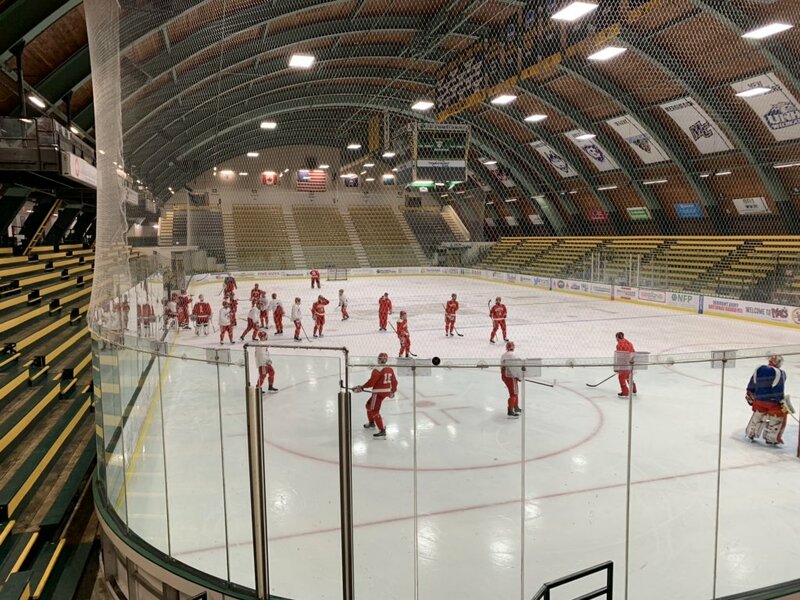 The Terriers, beginning a two-game series against Vermont in Burlington, will be looking for critical points as they seek to gain home ice for the Hockey East playoffs. Tonight’s game, set for a 7 p.m. puck drop, will be live-streamed. BU is tied for sixth place with Maine, three points behind Northeastern for the final home ice berth. It will also have to jump ahead of fifth place BC. While gaining home ice appears to be a longshot, the Terriers can clinch a playoff berth and eliminate the Catamounts with a win tonight. Four Terriers - Shane Bowers, Bobo Carpenter, Patrick Curry and Joel Farabee - have 10 or more goals this season. Only six other teams have that many 10-goal scorers. BU’s penalty kill, successful in defending 38 of the past 39 power plays, is now 16thin the nation at 84.4 percent. 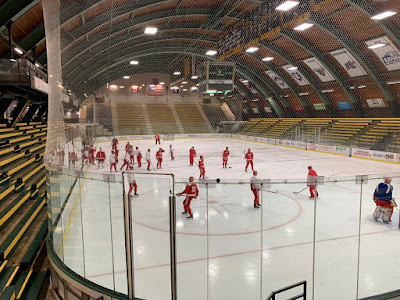 Vermont is 2-3-1 in the past six games after dropping a pair at Northeastern.The Catamount offense is led by sophomore Max Kaufman (18 points), senior and former BU recruit Liam Coughlin (17) and sophomore Alex Esposito (16). Junior Stefanos Lekkas has been in goal for all UVM games, producing a 2.28 GAA and a .930 save percentage. 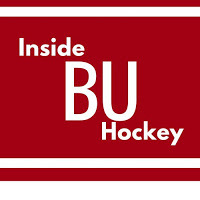 This week’s episode of Inside BU Hockey features Bernie Corbett’s interviews with Head Coach Albie O’Connell, UVM radio broadcaster Michael Lehr and sophomore forward Jake Witkowski. Jordan Greenway scored his 10th goal in the Wild’s 4-1 win against the Rangers. #8 Terriers begin their final weekend of the regular season with a visit to UConn on Friday. Game time at Freitas Ice Forum is 6 p.m. Currently third in the Hockey East standings, BU can finish second with a pair of wins this weekend and a BC loss to New Hampshire. BU owns the tie-breaker vs. the Eagles. This will be the third meeting between BU and UConn. A meeting in October finished as a 1-1 tie. In November, the Terriers came away with a 4-1 win. Sophomore Jesse Compher has been named a top-10 finalist for the Patty Kazmaier Memorial Award, presented by USA Hockey. 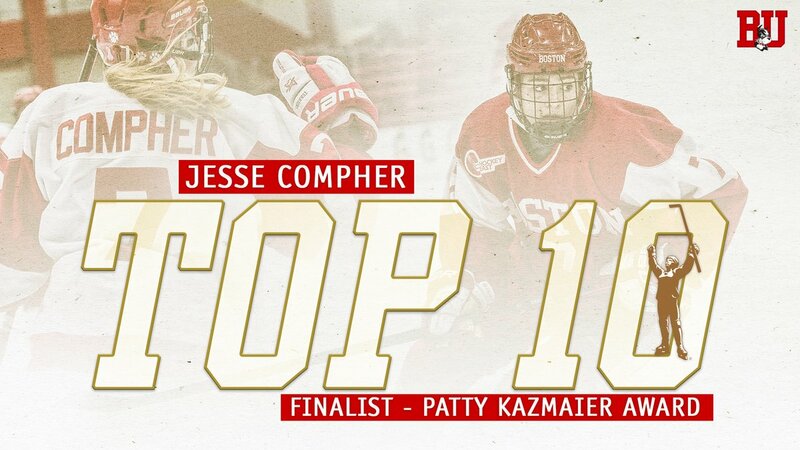 Compher is third in the nation with 55 points and first in assists with 38.